Tree With Deep Roots is based on a novel written by Lee Jeong-myung of the same name, a fictional account of the obstacles in the creation of Hangul by King Se-jong the Great. I know little about Korean history, but you can take most in this story to be fictional. 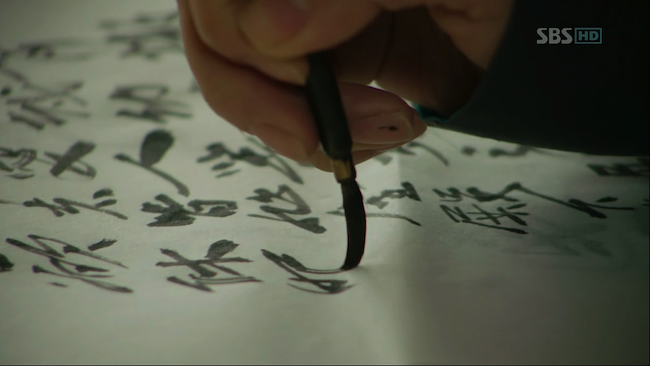 The creation of the Korean alphabet and several characters are based on historical truths, as are certain ideologies (Confucianism, Neo-Confucianism), but a lot of truths are mostly used to service fiction (the Bonwon organization, Ddolbok). There are so many things I enjoyed about Tree, and there are so many things to enjoy. For one, like I already posted earlier, the visuals are lush and radiant, the production distinguished and impressive. As far as I know, this wasn’t a big budget drama and it probably didn’t cost more money than other sageuks did to produce, but there was such a high quality of production that made the entire viewing experience incredibly enjoyable. Scenes were crafted in a way that belied the fact that this was a drama: at some points, I really thought I was watching a movie of greater ambitions. Something like production value and artistic vision are things I feel that K-drama watchers don’t often take into consideration, until they come across something really great and out of the norm like Tree. There’s a certain level of predictability built into K-dramas that watchers have been conditioned to accept, and so it’s such a pleasant surprise when the director and producers of Tree did what they did and flipped those expectations to work within the confines of its production realities. Tree wasn’t a ginormous multi-set production that spanned many locations; it ultimately did rely on a limited number of settings to tell its story, but within these realities, the director and the crew were able to make a lot of magic happen, and told their story with finesse and vision. In terms of the story, Lee Jeong-myung deserves a lot of credit for crafting such a layered narrative. Sageuks can be such a crapshoot with real history, as in there’s really always a 50/50 chance that the drama can either be rooted in some sort of history and that writers are interested in fleshing those details out, or they’re just borrowing the idea of history to create narratives that are not plausible in modern settings. So it’s respectable that Lee really enriched his story with actual basis in Korean history and didn’t do history a disservice. I do think that sometimes the history aspect of this story was so heavy that it might’ve really been confusing and/or boring to those who are not already interested in these histories, which can be a weakness to some, but was not to me. Plotlines and conflicts were fully fleshed out and while it can be said that history is already on King Se-jong’s side — he is already a victor, history has decided this — he was so real and flawed that even knowing that he will be a victor left me uncertain of his fate and the fate of his mission. There was just no room for you to doubt his character, and King Se-jong is singularly the most compelling element in Tree. King Se-jong (hereafter Lee Do, his birth name) is a happy example of an amalgamation of fantastic writing and incredible acting. Lee Jeong-myung wrote a great king: a nervous, worrisome, obsessive, but ultimately admirable and fatherly king. His king actually illustrated the magnitude of being a king and the sick, psychologically confining burdens of ruling a nation, a plot point that is so worryingly cheapened in lesser sageuks. Han Seok-kyu and Song Joong-ki did unbelievable jobs portraying the king. I didn’t know how I felt when I first read about Song taking the younger portrayal of Lee Do, just because while I adore the guy, I didn’t think he had it in him to play a character of such gravitas. But every second of his four episode appearance was phenomenal, including the following scene (starts at around 1:44, please please please try your best to ignore the criminal One Republic music playing, my original clip got taken down by SBS). Song Joong-ki did a great job laying down the foundation of a wavering king, one who is emotionally anguished over doing the right thing and just doing anything, an emotional battle that consumes older Lee Do and one that possibly never resolves itself by the story’s end. He seems to live by hanging onto the notion that “All we have to decide is what to do with the time that is given to us,” given to us by the ever wise J.R.R. Tolkien. Being the king and being a righteous king is a burden that is only Lee Do’s to bear, and his conflicts are to either let himself be consumed by paranoia and to keep himself in power by quashing all rebellion, or to do something meaningful as king. Lee Do is easy to like, despite being extremely flawed. His moral compass is so unwavering that it’s maddening, but also incredibly admirable. A perfect example of this was when his son was kidnapped and the ransom was perfectly deliverable: stop the letter-making process and the kidnappers will let him go. This happened twice in the story, which was also a nice narrative tweak: the first time this happened, nothing happened. The second time it happened, Lee Do stayed resolute, even though waging an immensely large internal war with himself over doing the right thing, which ultimately meant that his son had to sacrifice his life for it. It’s also admirable how strongly Lee Do’s son shares his father’s morals in that even though it’s a sad narrative turn that he died, we still believe the death was a martyr’s death and that it was ultimately necessary. Lee Do was easily the brightest spot of this drama, and of all the dramas I’ve ever watched. His character, his battle, his philosophies were compelling and intriguing. With that said, this story wasn’t perfect. The pacing of the drama was great for about 3/5 of the drama, but slowed down substantially in the last two-fifths, which means that the episodes could have very easily been shortened. This drama was cerebral, no mistakes about it, but towards the end the material got redundant. There was too much dialogue, too much conversing. So much so that I couldn’t stop writing that there was just too much of it. In addition to the excessive dialogue and the pacing problems are the two other main-ish characters, Kang Chae-yoon and So-yi, played by Jang Hyuk and Shin Se-kyung respectively. Lee Do is such a steadfast character that he can come off as bullheaded, and he needs allies who give their approval for his projects, as it’s a means of legitimizing his mission. I get that and I get that that’s primarily what most of the characters are there to do. I had less a problem with So-yi primarily because she wasn’t as central to the story, but Chae-yoon is, and his character didn’t do it for me. Part of this is because I cannot stand Jang Hyuk, and part of it is because Chae-yoon is so overbearing. He’s preachy and redundant, and comes off as incredibly unlikeable. His love story with So-yi also isn’t developed very well, and Jang has little chemistry with Shin. The drama unfortunately invests a lot of story on the pairing, so that’s more than enough screentime wasted. …which leads me to the final episode. This is probably one the worst final episodes I’ve seen for a drama this good. How can you have almost EVERY single one of your heroes die before any of your villains? There is no emotional payoff when you pull a narrative stint like that, and there was such an emotional climb towards the climax that this episode was one of the biggest let downs ever. None of the hero deaths felt necessary, just like none of the villain deaths could undo any of the protagonist deaths. The last episode failed on so many levels because of this disaster in writing. Last episodes always cement your impressions of dramas, as unfortunate as that is, and my overall impression of this drama dropped because of how the end was put together. 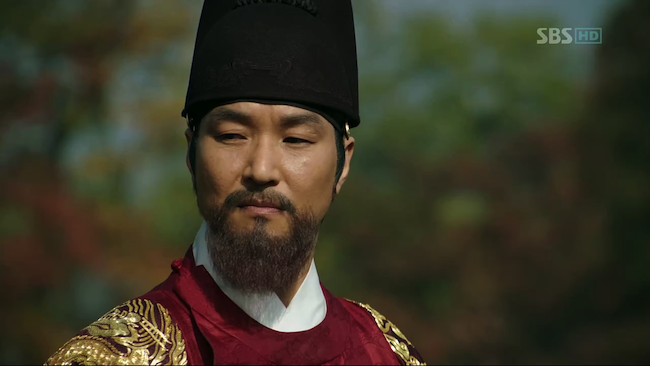 All in all, Tree With Deep Roots is still one of the best dramas I’ve ever watched purely because of its cerebral engagement, and how attached I became to Lee Do, the best fictional king there ever was. It wasn’t the perfect drama, and there were many things I wish were done differently, but Tree is really a series to invest some time in for a better understanding of Korean history and for an understanding of the true potential of Korean dramas. Thank you for your review. I apologize for my SM/EXO analogy. I meant nothing malicious by it. Personally, I was thrilled when you actually caved in to watched the drama. (I was one of those pest-y followers who had initially asked if you were going to watch and recommended you to watch, so I knew about your initial hesitation.) I actually didn’t expect you to write a post about it, but then you did Part 1, and then tweeted a couple of times about working on Part 2, so I naturally looked forward for your review. I truly respect and always enjoy your drama opinion-caps. You have no idea how ecstatic I am right now to finally be able to read this post. Again, thank you and sorry. Haha it’s all good, I meant it in jest and it’s good you left me that comment, I wouldn’t have really felt the need to nip this post in the bud otherwise.